An injection of stem cells has been used to cure mice with a normally fatal nervous system condition. The therapy which helped repair faulty nerve wiring raises hopes of treatments for children with rare and deadly nervous leukodystrophy disorders. A UK expert said human treatments were still some way off - but potentially the technique could be used to treat conditions such as multiple sclerosis. The US study features in the journal Cell: Stem Cell. The scientists from the University of Rochester Medical Center believe it may be the first time that this type of "shiverer" mouse has been cured. Its genetic makeup means that its nerve cells do not have enough myelin, a fatty coating which acts like the sheath on an electrical wire. Without it, nerve signals do not travel properly from cell to cell, causing the trademark shaking and wobbling symptoms, and normally death within four months. There are dozens of rare human disorders which involve genetic myelin-related faults in the nervous system, most of which are fatal in childhood or young adulthood. One of the most well-known of these affected Lorenzo Odone, who died last week after decades battling adrenoleukodystrophy. The US team did not use "true" stem cells, which have the ability to turn into any cell in the body, but precursor stem cells, which can become one of a limited number of cell types. 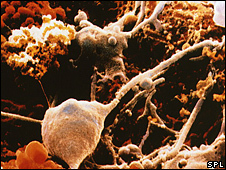 The "glial cells" used here can become among other things, oligdendrocytes, the cells which produce the myelin sheath. The cells were injected in different places in the central nervous system in a bid to see if this could make any difference to the overall symptoms. For most, it made none, with three-quarters of the 26 mice injected dying around the same time as mice who had received no treatment. However, for six mice, the difference was stark - in just two months, the cells had spread around, multiplying, and covering nerve cells in the brain and spinal cord, and producing myelin to coat them. Two of the mice lived longer than usual, but the other four were still alive a year later, free from virtually all symptoms. Professor Steven Goldman, who led the study, said: "We kept expecting them to die, but not only did they not die, they improved day by day. "It's extremely exciting to think about not only treating but actually curing a disease, particularly an awful disease that affects children. Professor David Attwell, from University College London, said the study represented an "important proof of principle" that transplantation of these "precursor" cells could help restore myelin not only within people with leukodystrophies, but in theory within those affected by other conditions involving loss of myelin, such as multiple sclerosis, cerebral palsy and spinal cord injury. However, he said: "The work is still a long way from being applied in humans, and the paper raises several issues which could affect the chances of that happening. "Only a small fraction of the mice were cured, and it is unclear why." He said that other potential hurdles were whether within humans, defective myelin-producing cells would be as readily replaced by the new transplanted in versions, and whether, as in the mice, the immune system would have to be suppressed prior to treatment.